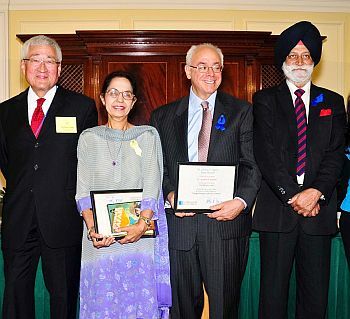 A two-day conference in Washington, DC celebrated the permanent installation of the Sikh Collection Initiative -- a set of over 80 books on Sikh history, literature arts, scriptures and classics in English and Punjabi -- at the United States Library of Congress's Asian Division. Called the 'Sikh National Conference: Taking Heritage into the 21st Century,' the event was organised by the Kaur Foundation in Washington in collaboration with the division of the library and the Asian Division Friends Society. It featured a series of lectures, panel discussions, film screenings and photo exhibits. The DC Council adopted a resolution proclaiming June 15 to 19 as Sikh Heritage Week. "There has been an overwhelming response from the Sikh community and the wider audience," said Inni Kaur Dhingra, a Kaur Foundation board member. "The speakers read like a Who's Who in Sikh art and history, and people travelled from across the United States, England and India for this event." The conference was held at the Jefferson Building and James Madison Memorial Building near the US Capitol. The program included a dinner reception at the Grand Hall of the Library of Congress. 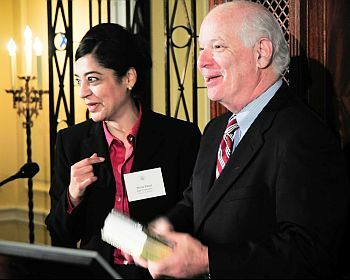 Mirin Kaur Phool, president, Kaur Foundation, said, "What would the Sikhs who came in the 1800s think, if they saw us sitting in this beautiful auditorium of the Library of Congress celebrating the launch of the Sikh Collection Initiative?" Several Congress members addressed the conference and lauded the community's contributions since the early 1900s in enriching the fabric of America's diverse society and culture. They included Senators Ben Cardin (Democrat, Maryland) and Richard Lugar (Republican, Indiana) and US Representatives Mike Honda (D-California) and Chris Van Hollen (D-Maryland). 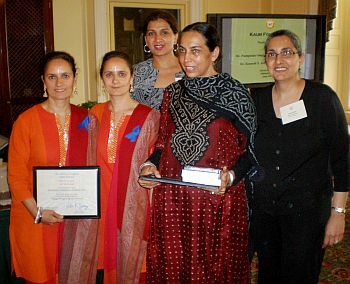 The conference commenced June 18, and included a session on 'Extraordinary Achievements of Sikh Women in Art', featuring United Kingdom-based artists the Singh Twins and Arpana Caur from India. A photo exhibition detailed the Sikh experience in America from the time of the first Sikh settlers on the West Coast through the present day. A session on the second day had writers, historians, artists and business leaders discussing the rich heritage. They included historian F S Aijazuddin from Lahore; Susan Stronge, senior curator, Victoria and Albert Museum in London; Navtej Sarna, India's ambassador to Israel; and author and journalist Christy Campbell. Another highlight was a panel discussion by NPR's Kojo Nnamdi of the Kojo Nnamdi Show and Sikh business leaders. Young Sikh professionals discussed how their heritage has played a vital role in their development. They included Arpinder Kaur, the first turbaned pilot of a major airline in America; Valarie Kaur, a filmmaker who travelled across America in the days after 9/11 filming instances of hate crimes against Sikhs and Muslims; Sonny Singh Caberwal, the first Sikh model who was featured in a Kenneth Cole ad campaign; and architect Ranjit Singh Rangr.